Sometimes it’s more economical to negotiate a settlement on your own when in an accident. This is typically the case when there is little injury or merely property damage, and clear liability in the police report. By the time you finish paying an attorney’s contingency fee of 25% to 40% and costs, it’s hard to “pencil out” a net recovery. The insurance companies know this and factor in just enough money to tempt you to settle without a lawyer. Most people settle, or file a small claims case, where the limit is $5,000.00, but there’s pending legislation to raise it to $7,500.00. If you’re going to do it on your own, you still may want to at least consult with a lawyer for basic advice. It can’t hurt. The Citizen’s Legal Press on this web site contains many informative articles “to get your mind right”. On the other hand, I believe you’ll recover more money (closer to a jury’s verdict) if you have an “objective” injury and hire an experienced trial lawyer. Objectively, you can see an x-ray or results of a medical diagnostic test result. A fracture, shoulder separation, scars, lost wages etc. usually bring in higher verdicts. 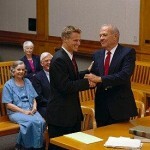 A trial lawyer can research similar verdicts from a data base, factor in experience and go to a jury trial if necessary. Trial attorneys knowhow to overcome low settlement offers generated by insurance computer programs like “colossus”, designed to save corporate profits by looking for technicalities like gaps in treatment, if medication was prescribed, and preexisting injuries. Use a doctor who meticulously documents everything. I could give you many examples of when it pays, but let me end with a recent example. A local Iraqi war Marine veteran was driving home one day on I-5 when another car lost control and slammed into his side door. Due to the force of impact, my client’s hand slid off the steering wheel and hit the dash board. He suffered a small new fracture, over an old basketball injury fracture from years ago – from which had healed long ago. This “pre-existing condition” was all the insurance company needed to “justify” a low ball settlement offer. The Marine wore a splint and lost some time from work due to the crash. His medical bills were about $1,500.00. The insurance company offered $2,500.00 to settle. We rejected their “settlement” offer, filed a law suit and served it on the careless driver. Within 33 days, USAA insurance company finally paid out their $15,000.00 minimal policy limits, but only after USAA forced their insured into litigation – at taxpayers’ expense…$5,000.00 a day to run a courtroom. It paid to fight with a trial lawyer; and it made me proud when I handed the family a check.